I’ve got Pilchard to thank for some of our more obscure travel destinations. If not for him, I wouldn’t be out birding. And if not for birding, I wouldn’t have been in this marvellously scenic spot near Werribee on the outskirts of Melbourne’s west! As I photographed the sunlight glinting across the waters of Port Philip Bay to Portarlington, and the panoramic vista stretching way past Avalon airport over the plain to the You Yangs, I wondered why no one else was around. Doesn’t EVERY visitor to Melbourne want to visit the sewage ponds?? Weirdly, it’s unlikely you’ll find the Western Treatment Plant facility on any ‘Top 10 Melbourne Attractions’ lists, despite its environmentally friendly waste treatment credentials. And while its 11,000+ hectares of filtration ponds and lakes give good photo opportunity, they’re not used to define Melbourne in the same way as, say, the Yarra. Or the Queen Vic Markets. Or even the Boathouses of nearby Campbells Cove***! I guess the opportunity to be where 52% of Melbourne’s sewage is being processed just isn’t that enticing. 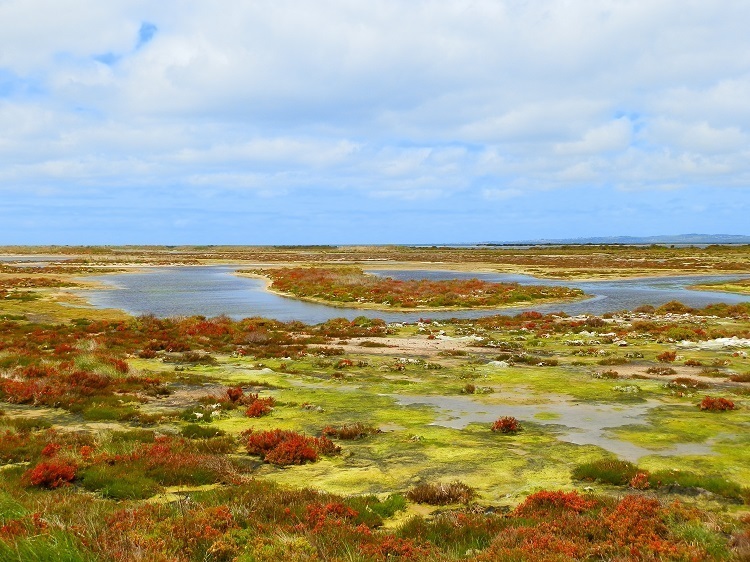 If so, you’ll know EXACTLY what a nice sewage pond is doing in a place like this, and call it ‘Werribee’ – the ‘in’ name for birders worldwide. 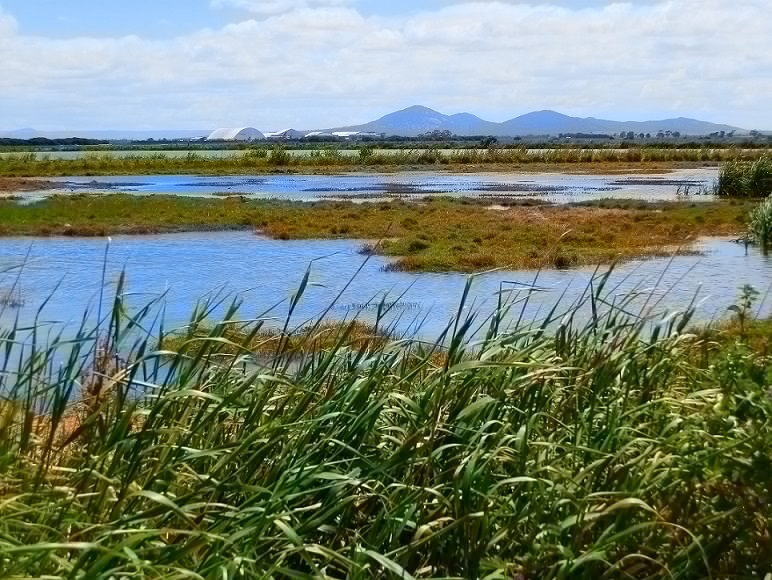 Because among the levees and lakes that make up the extraordinary patchwork of poo-ponds that is the Western Treatment Plant, the 284 species of birds recorded at Werribee from all over the world draw serious twitchers like flies to … well, you know. But … you don’t just ‘drop in’ to Werribee. Jumping through bureaucratic hoops to get a permit just for the privilege of visiting a massive set of poo-ponds may be incomprehensible to non-twitchers, but as Pilchard’s best chance to spot a few lifers**, he happily signed up, giving assurances we’d behave responsibly. Yes, there IS a sewage pond etiquette protocol! What’s a nice sewage pond doing in a place like this? If you’re looking for a comprehensive photographic catalogue of the birds we saw, then don’t buy a lottery ticket because today is not your lucky day. The ‘responsible behaviour’ expected from THIS passenger became an exhausting round of navigating through the complex maze of poo-ponds; opening and closing the locked gates that kept the riff-raff out (because EVERYONE wants to break into a sewage treatment plant, right?) and in my spare time, ‘helping’ spot the rarities Pilchard was convinced lay lurking behind every shrub eagerly awaiting his identification. Who says birding isn’t an extreme sport? Telling twitchers and non-twitchers apart is easy! Just apply this simple test when a twitcher tells you he didn’t spot an unusual bird seen by almost everyone else in the same spot: If you’re a twitcher, you’ll openly commiserate while secretly gloating because you’ve either trumped the other twitcher (ie the bird’s already on your list); or the other twitcher HASN’T trumped you! If you’re NOT a twitcher, you won’t care. In a perhaps unsurprising demonstration of the ‘camaraderie’ for which the birding world is sometimes known, an older couple (ie older than US), their necks hung about with several thousand dollars of optical equipment waved to us from across a pond. We drove around to muscle in pick their brains be sociable only to find they hadn’t been waving, they’d been waving us ON! We’d cramped their style by daring to slow down directly above a bird lurking in the grass below the levee bank! For a place surrounding one with 360° of sewage (albeit filtered and treated), there’s one surprising – and ironic – omission at Werribee. Perhaps a Public Toilet in a sewage treatment plant is redundant? So I didn’t think I’d be issued with a ‘responsible behaviour’ infringement notice just for doing a squat amongst the sewage ponds … I mean, how could you tell?? I’ll leave you to decide whether being surrounded by sewage counts as a public toilet; OR if Werribee is the BEST scenic spot NOT to have a loo!! If this post leaves you suffering from Australian Scenic Public Toilet deprivation, the best antidote is to visit a spot where you can see a baker’s dozen of them all in one place, right? RIGHT?? SO … put yourself out of your misery and check out my brand new Calendar – Dunnies of Distinction DOWNUNDER! And if that doesn’t do it for you, then check out my book – Aussie Loos with Views! * Twitcher = Birdwatcher. Who knew?! ** Lifer = Bird never before seen by you. *** Tourism Victoria: I guess you’ll be BEGGING to use my Werribee photos to help promote Melbourne now, right?? Next Post: Aussie ABC: O is for Opal! Ride the Ragged Ranges: The RED HOT Arkaroola Ridge-top Tour! Beautiful pics, esp whilst seeing all the grey here every day now! Can you believe it – not one (real) Black Swan spotted in Perth this time – how can that be?! @Jill – The origin of ‘twitchers’ is lost in the mists of time, which is a fancy way of saying I haven’t had time to google it!!!! No noticeable smell – for us, anyway – but I hope it was wafting all around the BIG lenses!! Maybe I’m just getting cantakerous, but I found them irritating rather than intimidating!!! @Linley – Hahahaha! They’d have got more than they bargained for if they did!!!! Besides … if they publish me squatting, I’ll publish them on the wrong levee bank! That’s only fair, right?!?!?! @Susan – I am SOOOOOO flattered … but now I’ve got writers block – how can I possibly top the poo ponds in my next post?!?!?! Please feel free to drop by anytime with comments like these – look forward to reading more from you on your own blog!! @TMWH – It would be the ULTIMATE public loo if they ever put one there!!!!! Maybe I should start up a petition??!! @Our Photos – Thank you, and same to you!! @EG Camera Girl – It’s just a giant practical joke that birds love sewage ponds so much!! But I learned a valuable lesson about taking my photographic opportunities where I find them!!! @ladyfi – Well, that’s the sewage ponds for you!! I was certainly surprised to find them so colourful and scenic – but of course nothing will outdo your own personal lake in Sweden! @Beach Bum – Well, they will just have to learn to live with their disappointment … we had just as much right to be there as them – even more considering we were actually on the legal track, they’d actually driven onto the WRONG LEVEE BANK!!! Maybe one day I’ll publish the pic I took!! @Manzanita – HHHMMMmmm… Hedlund? Not sure where that is … if it’s Port Hedland, a mining town in Western OZ, then the <24 hours I spent there on my one and only visit were more than enough for a lifetime! Let me know if that’s the place you mean!! @whiteangel – Couldn’t believe the number of waders – and it wasn’t even the peak season for them!! I’ll never pass judgement on sewage ponds again!! @Sallie – Hahaha, it’s just that I find the world of serious twitching a little pretentious!!! But I’ll never knock back an opportunity for Pilchard to show me a good time like this!!! @Fun60 – Haha! Looks like you’re up for a return trip just to come here!!! Surprisingly, there was no smell – I think the ponds accessible to the public are at the end of the sewage’s long journey!! @Anne – I did spend a little time at the fabulous You Yangs (look out for a future post). I think the filtration system must have been working well when we were there – I didn’t notice the smell at all!! But maybe it was just the excitement of being in Melbourne’s largest treatment plant!! @Joanne – Who indeed?! I challenged myself to make them look totally unlike sewage ponds – luckily for me, this was fairly easy!! @TFG – No birds were harmed in the making of this post – the origin of the water seems to make no difference!! Wherever we go, P is on the lookout for sewage ponds because that’s where you see the best/most birds! Who knew!! @Andrew – How great would it be to have a school excursion to the Poo Ponds!!!! Although it IS an interesting spot, I can’t imagine going there except for the birds!! But shame on you!! How can you be a true-blue Melbournite and NOT go there??!! And thanx for the tip – I’ve visited the other Campbells Cove mention! Weirdly, it also featured on the calendar my local chemist gives out!! @River – I’m SO grateful you’ve bought ONE calendar – no need to get two!! The 2nd loo calendar will still be available next year, anyway!! @Carole – I’ve read ALL Sean Dooley’s books!!! But Pilchard’s the one who carries the ‘Big Twitch’ on our travels as a reference guide … and the BIG lenses don’t know just how close they came to having their picture published!!! @Joop – Thank you my friend! This is a different side to Australia, yes?! @Weekend Windup – So glad you enjoyed it!! Thanks for stopping by my blog and leaving a comment. I do appreciate it, and it was my pleasure to return the favor. But now, you’ve got me! How can I possibly resist anyone who writes about poo ponds and twitchers? Alas, I cannot, so I have no other option but to sign on as your newest groupie. Fun post! It’s nice to meetcha. What an ingenious way to clean up the sewage, and draw in the birds! Although not having a public loo in such a place, when inevitably you will think about what’s being “treated”, seems rather cruel, don’t you think? once again written in your fun and informal but informative style! I always love reading your posts Red. I think I would be intimidated by those twitchers with the big lenses. and why the heck are they called twitchers? And did the sewage ponds smell? thanks Red! Such beautiful photos who would have thought sewage ponds would look so pretty. Red, having lived more than my fair share of my life in the area close to the Werribee Sewerage Ponds I can certainly agree that the view over the You Yangs is stunning! They are also worth a closer look as there is some great walking and rock climbing around the area. Close by are the Brisbane ranges (near Melbourne of course just to be confusing) which are also worth visiting. Love the infringement notice! And I hope it wasn’t too smelly when you were visiting. Lets just say that when the wind blew in a certain direction we certainly knew were we too close! That sure is the prettiest sewage pond I have ever seen Red. Lets hope the twitchers didn’t have their lenses pointed on you squatting. Still not sure about putting it on my list of places I should have visited but didn’t whilst in Melbourne. You didn’t comment on the smell. Oh girl, you be nice to your favorite twitcher He has led you to some beautiful places and really this is one of them — had you not told us what it is I would have just enjoyed the scenery. But I did appreciate the laughs, so I’m glad you told us. Actually I know of at least two sewage/waste/whatever-they’re-called facilities that have been turned into birding spots on purpose (while still serving their original purpose) and they are great. One in Texas and one in California. Beautiful scenery. Ha about the pond/s. Birds would be wonderful to see in those wetlands. It was interesting to see your photos and to know about the pond. Beautiful photos. Thanks for sharing!! well it was interesting to actually see the Werribee Ponds of which I’ve read about …Sean Dooley accounts etc. Pilchard will know Sean. I did get a laugh out of the wave-on by the big-lenses. I know a person who has never been to Australia but through reading, I guess, has fallen in love with Hedlund. Have you ever visited there or have you written a post about it? …they hadn’t been waving, they’d been waving us ON! We’d cramped their style by daring to slow down directly above a bird lurking in the grass below the levee bank! Yeah, I spoiled someone’s attempt at getting a picture of some crane once while I lived in Texas. Dude was seriously upset. These wetlands are a heaven for many birds, never mind where the water comes from. Know of two similar places, one in Oklahoma and a huge wetland in New Mexico called the Basque del Apache. Flocks of water birds come from all over the country to spend the winter. It is a photographer’s heaven as well. Love your photos. Great views and very nice photo’s…… thanks for sharing this with us. Oh no! Another fabulous Loo calendar, when I’ve already bought the sunsets one. I simply don’t have anywhere to hang a second calendar, even if I did, my budget is used up for this year. I love the swan and cygnets and all those waders. So many waders! Known to people of Melbourne who are around my age as the Werribee Sewerage Farm. I, and no-one I know has ever been there, though I think I have heard of school groups going there. Overhearing their conversation when they visited would be a laugh. I had not heard of Campbell’s Cove and then two I read two posts mentioning it on the same day. What a funny post, Red! Birds can be found in the most awful spots. Waste Treatment plants and trash dumps are both places the birders are running to for a specific bird. Your photos are great. Have a happy weekend!